I have great admiration for the courage demonstrated by the founder of this facility, Joe Schrank. Several years ago I contemplated offering a similar option, but finally relinquished the idea as being too far ahead of public opinion, and especially the opinion of the addiction treatment industry. I don’t think the industry has changed much, but the public has. The facility is gaining good press coverage and a growing number of inquiries. Practical Recovery has since its inception used a harm reduction framework, which includes accepting marijuana use as a transition or a final stage. However, following the lead of High Sobriety, we may begin explicitly advertising this idea. Joe and I have been acquainted for a few years. I connected with him for this (edited) interview. Tom Horvath (TH): How did you decide to start this facility? Joe Schrank (JS): The personal reason is that several years ago I had a very close friend die from substance problems. He was a brilliant guy. I miss him terribly. At the time I thought, if I could just have got him to smoke pot, and give up everything else, he might have lived. The whole awful experience of his death led me more and more to thinking about harm reduction. High Sobriety is a harm reduction program. We focus on helping people move from using potentially lethal drugs to stabilizing and maintaining with cannabis. If clients want to move toward total cessation, that’s certainly a decision we support, but we don’t push it. I have been in the treatment business for a long time, including working in fancy rehabs as well as prison programs. I also started the first sober living home in New York City. Over that time I have come to think that all addiction providers should be ashamed about the abysmal rates of improvement we get with our services, and about our insistence that there is only one road to recovery. Further, when clients aren’t making progress on that one road to recovery, we typically shame them. We tell them they aren’t doing it “right.” We even punish them for having the issue they have come seeking help for. Our behavior just doesn’t make sense to me anymore. We need to broaden our perspective about what success in recovery is. Success is much more than a clean urine screen. When you start thinking more broadly about success, you realize that what we are doing in High Sobriety has the potential to be very successful. TH: How has your professional training influenced High Sobriety? JS: My training is in clinical social work. Focusing on harm reduction, which we can also call life improvement, is a strong tenet of that training. Clients have the right to self determine, even if they are determining themselves off a cliff. We have a duty to warn, but people get to make decisions that don’t please the people around them. So my clinical training fits well with starting High Sobriety, even if it is a bit of a pariah in the traditional recovery community. TH: You have been quite open about your involvement in AA. What has been the reaction of your peers? TH: I understand it has been 20 years in recovery, as of this month. Congratulations! How do they treat you in your home group? JS: Like a leper. I’ve heard everything from “money grubber” to “drug dealer.” It’s fine. I get that people hold AA to the standard of a religion. I have been around long enough to see the patterns in AA, and I have my known and trusted people on whom I rely. It’s a choice. If you are going to be a rabble-rouser you shouldn’t complain when people come at you. TH: What are your goals for High Sobriety? JS: My hope is that High Sobriety expands the recovery road. I’m not suggesting that we have the best solution, or a solution better than abstinence. However, I am saying that by not accepting that some people choose safer use or medication assistance, rather than choosing abstinence, we are banishing them to shame and secrecy. It’s very odd to me. We would never say to someone with diabetes: “Take insulin? Certainly not! You’re not exercising enough and not eating right. You need to make yourself stable, and if you do that you won’t need to rely on insulin.” Why would we say something like that to people seeking recovery? It makes no sense. TH: What kinds of individuals have expressed interest in admitting? JS: We have had wide interest, everything from exasperated parents who feel like the rehab industrial complex has failed them, to people seeking to get off opiates, to folks interested in pain management. TH: What kinds have actually admitted? JS: To date, our admits have been chronic and long term heavy drinkers. They report that using cannabis helps them stay off alcohol. The truth is, they will live longer, happier, and healthier lives using cannabis. Alcohol is killing them. When you drink all your life things start happening, you start falling apart, especially in your 60s. TH: What would you say to someone from the 12-step tradition who is completely opposed to your facility? JS: The first thing I would say would be “thanks for sharing!” Then I would say “this isn’t AA and doesn’t have anything to do with AA.” AA is a specific framework of recovery. It has been helpful to many people, myself included, but that road is far too narrow for the scope and complexity of many individuals in contemporary society, who may have a range of substance use problems. TH: What would you say to someone from the 12-step tradition who is not completely opposed to High Sobriety, but very doubtful? TH: How hard was it to hire staff? TH: Would you have opened if California had not legalized cannabis? JS: Absolutely. Medical cannabis has been legal in California since 1996. The recreational use law is reflective of changing attitudes but doesn’t really speak to the potential medical applications. TH: What will you do if the Trump administration decides to enforce federal law, in which cannabis is illegal? JS: That’s an excellent question. My hope is “states rights, small government” Republicans won’t do that. The truth is, I have always felt drug reform is an issue for the right. It aligns with many things they at least say they want. There is nothing fiscally responsible about our current drug policy. The drug war is a dramatic example of large and wasteful government. There is nothing “Christian” about breaking up families with incarceration because of a drug issue. The drug war should be viewed as a government overreach. They all seemed fired up for their right to eat sugar and lard when Michelle Obama suggested carrots, but they don’t seem to make that leap with drug policy. Why should the government decide what goes into an individual’s body? If Trump’s administration decides to ramp up the drug war there will be backlash and it’s a dead end. TH: Any surprises in your journey so far? JS: My biggest surprise is how many people have said “that makes sense.” I am a sober guy and haven’t smoked pot in many, many, years but as I started doing research I started hanging around dispensaries. I was surprised at the diversity of ages. Lots of older people are finding relief from the aches and pains of aging. At a dispensary I talked to a retired librarian. She looked like a retired librarian! But she was at the dispensary because it helps her arthritis and she sleeps better. One of my goals is to push back hard on the cliche of the cannabis user. It’s not all Pink Floyd and skateboards, it’s sweet retired librarians too. TH: Do you think your clients will attend mutual help groups, and which ones? JS: I hope they go on a recon mission with all mutual help groups and see what fits for them. That would include AA. If people are true to the literature, “the only requirement for membership is a desire to stop drinking.” There’s no requirement to be yelled at by a plumber who doesn’t like your recovery, so I don’t think AA is out. SMART is a good option too. We are certainly looking to provide space and support for folks who are on medication management but still want the help of mutual help groups. I think we should call it “Bob, the mutual help group” so we can steer clear of being laced as being for this or that. I’m looking to the Jesuits on this one. My son goes to Georgetown and they say they welcome all faiths or no faith at all. AA indoctrination camp rehabs are like going to a university that requires you to believe in a specific faith. We’re Georgetown. TH: Do you have a favorite anecdote or two about your journey so far? JS: Being raised by a traumatized Vietnam vet gave me a soft spot for trauma and combat vets. We worked with a young guy, two combat tours in Iraq. He was effectively drinking himself to death and had some serious collateral damage. He wouldn’t even talk about abstinence, but he has done well with cannabis. There are massive life improvements in many areas of his life. That’s what I hope we’re doing. 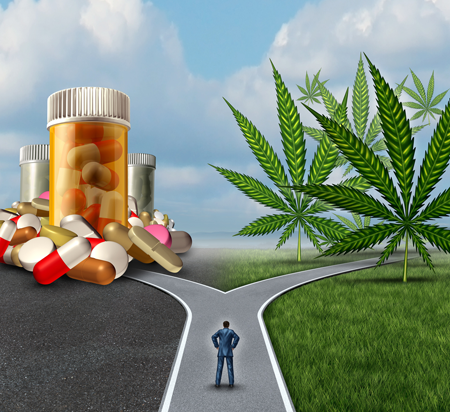 Interested in learning more about harm reduction and cannabis-friendly addiction treatment? Email Dr. Horvath today!